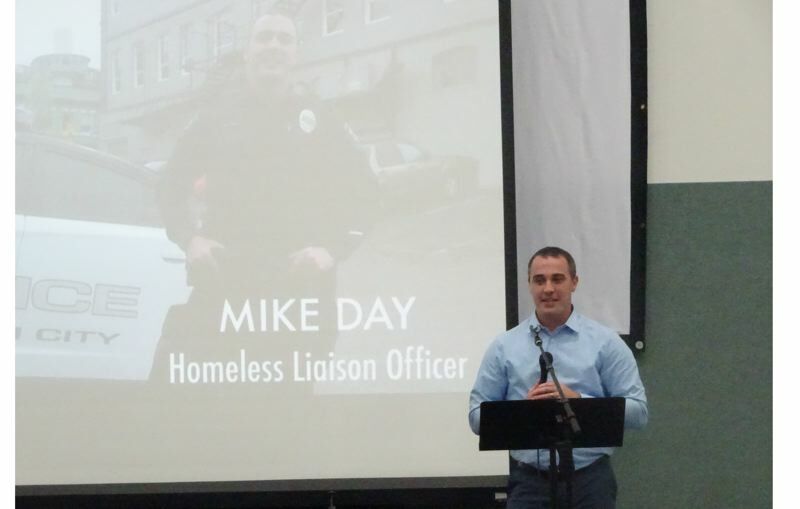 On May 12, Love In the Name of Christ of Clackamas County (Love INC) presented Oregon City Police Officer Mike Day with a special award in acknowledgment of his "outstanding service to the community" and partnership with the network of local churches. The commendation was Love INC's first Bob Eastman Service Award, named for the man who worked for many years in Love INC's furniture and household ministry (located at Zoar Lutheran Church in Canby) before he died in November. Day joined OCPD in 2007 and in July 2017 was appointed as the agency's first homeless liaison officer. He works directly with homeless people to address the barriers they face to getting housing. For the past couple of years, he has assisted in securing housing and employment jobs for many people. At the dinner, Day shared some of his life story, which included difficult times growing up in a single-parent home. He acknowledged that "no homeless person's story is the same," and that it's difficult to help people he encounters unless he partners with various community agencies such as Love INC.
Day's award was presented at Love INC's annual dinner at Trinity Lutheran Church in Oregon City, where "Restoring Our Community Together" was the dinner's theme. City Commissioner Nancy Ide also gave a speech to inspire dinner attendees. Love INC is a network of over 40 churches in Clackamas County that is committed to assisting people in need through more than 100 volunteers. For more information, check out clackamasloveinc.org.